Earlier this week we posted Donnchadh Mac an Ghoill’s interview with Sadiq Al Timimi on the current conflict in Iraq, in historical, local, and international contexts. Given the mounting ex post facto justifications for another round of heightened US military intervention in Iraq, already well underway and with no defined limit in either the scope of possible actions to be undertaken, or a temporal limit for such interventionism, we opted to counter some of the dogma and myth-making that has been so effortlessly produced by those with ample practice—and interest—in justifying the further militarization and Americanization of Iraqi affairs. More US intervention is the last thing that is needed in Iraq. The current phase of conflict (the rapid advance of the Islamic State forces, also referred to as either ISIS or ISIL) is in many ways the direct outcome of US and other international intervention in Iraq over the past quarter century at least (and the failed campaign to back the armed overthrow of the government of Syria). The effective partitioning of Iraq to separate the Kurdish zone is one consequence of the illegal no-fly zone instituted and enforced by the US and UK throughout the 1990s. 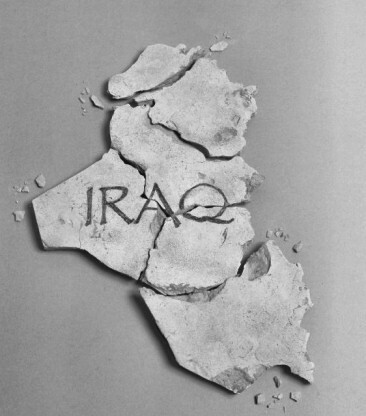 The gradual and then drastic destruction of the Iraqi state, via international sanctions and then with the invasion and occupation that started in March, 2003, deliberately and intentionally created disorder. This was a grand act of vandalism, designed to terminate a unified, secular state that had been forced to oppose US interests. Arming and training sectarian militias as part of the “surge” and General Petraeus’ counterinsurgency strategy, opened the door to atrocious ethnic cleansing that has not ceased since it began under US tutelage. An unstable government in Baghdad, and inter-ethnic violence, is precisely what American victory looks like. If after Iran, and after Russia, the US chose to renew its military intervention, it is not because it feels threatened by disorder—it is only threatened by the disorder that it cannot efficiently manage to its own ends. Otherwise, there is no special “humanitarian crisis” in Iraq other than the one which the US and other western powers have been deliberately implementing since 1990. The greatest humanitarian crisis suffered by Iraq thus far has been the unprovoked naked aggression of the US against Iraq, committing a crime of the first order of importance under international law with the 2003 invasion. The subsequent commission of numerous war crimes by the US military, and atrocities against civilans, including torture, mass detentions, and the deliberate destruction of civilian infrastructure, are all crimes for which the US remains to answer. Some sporadic air drops of water and food cannot erase that, and by the US government’s own acknowledgment, confirmed by facts on the ground, current US military intervention is no solution to Iraqi problems. It is, however, an open door to even greater intervention over the long term. Meanwhile, US plans for a political solution are inconclusive, inadequate, and generally poorly conceived. As we see, the US is only bombing ISIS when it gets too near to US business interests in Kurdistan—which is not to say that the US should do something otherwise. Otherwise ISIS can do as they like, as they have in Syria with the support of Turkey, a member of NATO, and US allies such as Saudi Arabia and Qatar, along with US funding and equipment itself. Further US intervention can only further delegitimize the Iraqi state and army. For all its many faults, the Iraqi state has been developing an independent foreign policy over the last few years, having refused to become part of the US lynching of Syria, and building up economic relations with China, Iran and Russia. Now the US has clearly backed, if not engineered, a constitutional coup against Prime Minister Nouri al-Maliki, adding further instability at a time of great political vulnerability. Iraq is well capable of dealing with ISIS—indeed, when left alone, it was almost most capable of dealing with such extremist movements. Even the Ba’ath Party, in the person of Izzat al-Douri, has declared ISIS a criminal element and condemned their sectarian atrocities, so ISIS has no real future in Iraq, and they certainly do not present an existential threat. If Iraq looks like a “safe haven” for extremism now, it is as a direct result of US intervention. More US and western intervention will not solve the problems that such intervention caused in the first place, nor are the results we are witnessing innocently accidental and unforeseen consequences. The US’ aims in Iraq have never been, and still are not, about saving poor civilians in Iraq. Thank you Max for recapitulating the criminal file of American intervention in Iraq and the surrounding region. In my view ISIS (Islamic State of Iraq and Syria) or ISIL (Islamic State if Iraq and the Levant [Syria and Lebanon]) is a transparent and crude American creation (like the Taleban during the 1990s) to further destabilize the existing political structures and processes to the advantage of Zionist Israel and American pimps (especially Egypt, Jordan and the Saudis) in the Middle East. The current phase of intervention in Iraq is the preface to another large scale criminal military undertaking aimed at creating a Kurdish state —a “Kurdistan”—that will rearticulate and destabilize Southwest Asia and create a “national” state for the 23 million Kurds spread over northwestern Iran, northern Iraq and eastern Turkey. This will not only further deconstruct Iraq, it will also destabilize Iran and Turkey. It will create another Zionist subsidized political, ideological and territorial gulf and conflict zone between the Sunnis and the Shi’as and between Arab, Kurdish, Persian, and Turkish ethnolinguistic groups. On a more specific level this is, in part, the American criminal way of reciprocating the recent Turkish support (albeit nominal and symbolic) for Gaza and Palestine in general. More importantly, the American Zionist scam will drag Iran into a much desired direct military encounter with the Sunnis, especially Kurds and Saudis, and indirectly with fascist Israel. Ultimately it will create the pretext to “bomb” Iran. American sponsored Zionist Israel will not rest until it totally drowns the Muslim world, especially the Middle East, in its own blood. Movement toward achieving this American subsidized Zionist objective brings fascist Israel closer and closer to committing the greatest mass suicide in the history of mankind. A Middle East “safe for Israel,” is a Middle East divided against itself, war of all against all. What is also interesting about groups such as Al-Qaida and ISIS/ISIL is how they have never attacked Israeli targets, certainly not in Israel but also it seems nowhere overseas. Their main targets seem to be Africans, Arabs and Persians.